The other day, I requested a copy of a book by C. S. Lewis’s good friend, Charles Williams. And what did the library end up giving me? 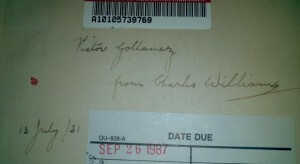 Not only a first edition of the book, somewhat frail and held together with a rubber band and stuck in an envelope for safety, but the autographed copy that Williams himself gave to the well-known British publisher, Victor Gollancz. And they sent this to me, a total stranger, with no idea how trustworthy I might be or (apparently) how valuable the book might be.